Featured Samples. Current works and select archives available on Medium and Patreon. 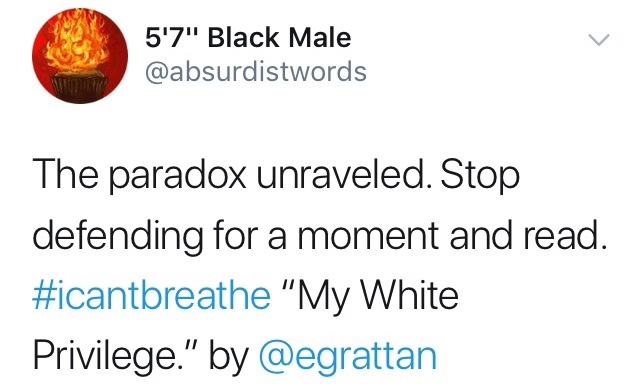 "And that is white privilege. Because as a black woman I’d be dismissed. I’d be called angry and irate and someone who isn’t grateful enough that times have changed. I’d be making everything about race. I’d be pulling a martyr card and playing a victim. If I were a black woman you wouldn’t even listen. Because you wouldn’t have to listen. Because it wouldn’t have anything to do with you. So I’d never get through. And that is white privilege. That somehow when I, as a white woman, explain white privilege to you, you might listen. Because that’s how it happens. So listen." "Caleb Thomas Schwab Wasn't Brave. He Was Ten. How We Let A Child Die In Kansas" By Elizabeth Grattan. Medium Editor's Pick. August 2016. "As a bodily autonomy advocate, I say, go for it. If you want to jump out of an airplane at 25,000 feet without a chute, you ought to have that freedom. Provided your body isn’t going to do damage to anything or anyone. And if you want to climb 17 stories and get on a raft to plummet back down with G-Force, it’s totally your call. Who am I to tell you any different? You are a person with agency and you don’t need my permission. At all. But we aren’t talking about a consenting adult making a rational decision. This is a ten year old child relying on the same fabric he uses to fasten his shoes to fall 168 feet from the sky on water at 65mph in a world where velocity and physics rule." "The Privileged White Breastfeeding Woman" by Elizabeth Grattan. Global Viral with Write up by Daily Mail August 2016. "Black Breastfeeding Week isn’t yours. It wasn’t created by you. It wasn’t created for you. It wasn’t created with you. And if that pisses you off, good. Because the white woman has had plenty of time perched on the pedestals built by men that we’re way overdue to cherish the specific needs of women who to this day battle legacies and current barriers we white women will never comprehend. And if you can’t figure that out — it’s because you don’t want to." Elizabeth Grattan . August 2016. Read in entirety on Patreon. From short essays to long form prose, see the difference between click bait and organic viral. Copy. Content. Creative. For Broadcast, Print & Web. INCLUDES EXCERPTS OF SELECT CURATED WORKS AND PUBLIC PROSE. ACCESS TO CURRENT AND SELECT ARCHIVED WORKS FOUND ON patreon and medium partner program. exclusive content and updates. SIGN UP TODAY. AUDIO PRODUCTION. TALENT. PODCAST. VO. reprints prohibited without express written consent.